Aluminum foil strip is the key raw material for producing transformer winding, it is a kind of product process from aluminum ingot by smelting, casting, rolling and cutting. The transformer made of aluminum foil strip has the advantages of small volume, light weight, good insulation, flame retardancy, no pollution, small partial discharge, moisture resistance, stable and reliable operation, low noise and low maintenance cost. Due to these advantages, the most wide application of aluminum foil strip id in the transformer winding. 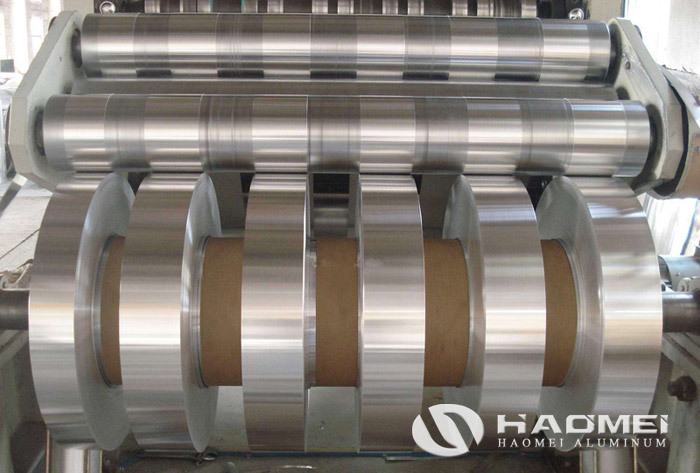 The thickness of aluminum foil strip is lower than 3mm, it is rolled in strip shape, while used for winding, aluminum foil strip is tensioned in order to maintain a certain tension, winds into winding coil smoothly, so the thickness of aluminum foil strip is required, if it is thicker, the required tension is larger, the maximum tension of foil winding machine is limited, is it is too thin, the winding tension is too small, the winding is too loose and can not guarantee the size requirements. The most used aluminum alloy of aluminum foil strip is 1060, uses high purity aluminum as the raw material, and the content of aluminum can reach more than 99.6%, which has unparalleled electrical conductivity than other series. The temper is O which also means temper soft, due to it is used in the transformer winding, the aluminum foil strip winds on the transformer, so the requirement of tension is high, only thin and soft aluminum product can meet the requirement. The width of aluminum foil is 20mm-1650mm. To aluminum foil strip, the request for surface is strict, the surface should be flat and clean, no corrosion spots, oil stains, wrinkles, crack, rub scratches, shading lines, printing rollers and other defects. The edge is round edge or round angle without burr, the resistivity is less than 0.028.